Discussion in 'iPhone and iPad Games' started by PROAPK, Jun 17, 2016. 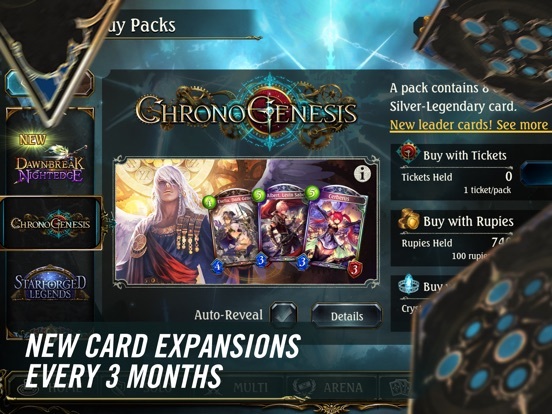 Shadowverse: the next evolution in collectible card games! 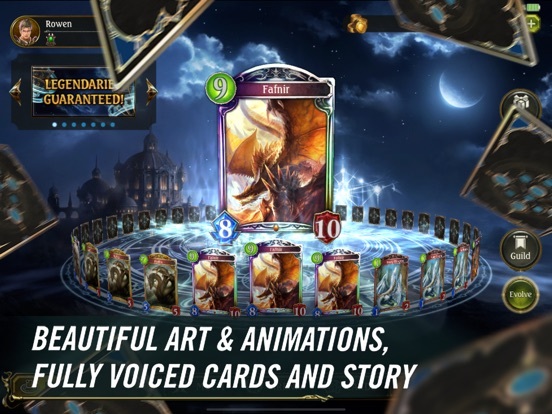  SUMMON THE POWER of 400+ cards, each lavishly illustrated with anime-style fantasy art.  STRATEGIZE AND STRIKE with evolution and other innovative mechanics. 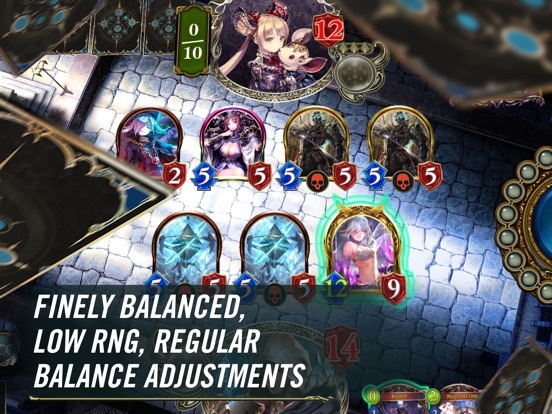  DISPLAY YOUR MASTERY of arcane arts like Shadowcraft and Dragoncraft in ranked and unranked battles.  JOURNEY FORTH through seven fully voiced stories, each with its own astonishing twists. A strange new world awaits! 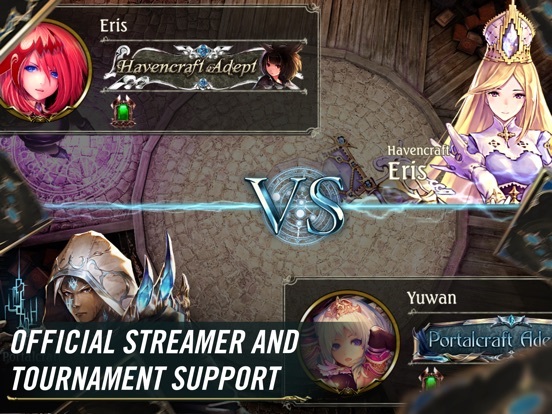 "One of my favorite games this year" - IGN Shadowverse is a AAA multiplayer turn-based card game with a fun–loving community of over 1 million daily players! 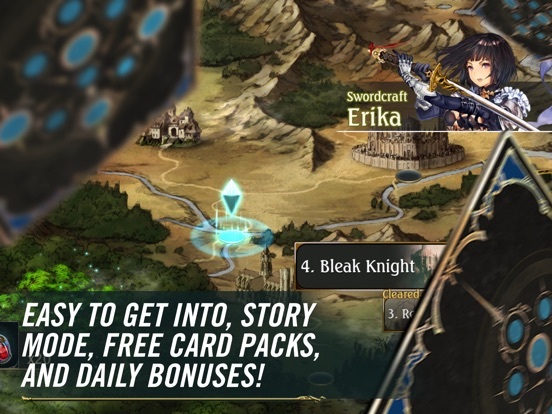 - BATTLE real–time opponents from around the world, or enjoy the fully voiced story mode - STRATEGIZE with innovative mechanics that guarantee epic battles - MASTER eight character classes each with unique paradigms and killer cards - SUMMON 1500+ cards, each lavishly illustrated with jaw–dropping fantasy art Install now for TONS of free gifts! BEST Hearthstone-like I have ever seen. 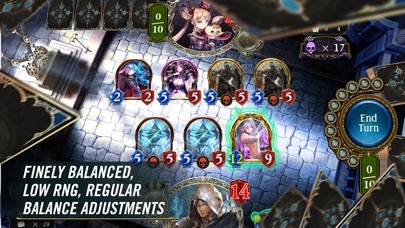 Better than Hearthstone, in fact. 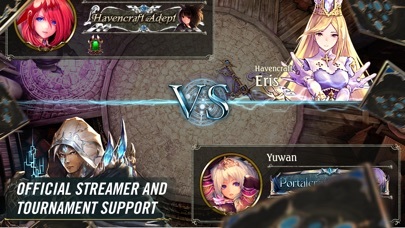 TBH, it's really smooth and they have done a lot of hard work to make itself look and feel original rather thn letting ppl feel it's a copy of hearthstone. Gd job. I have played five mp games so far and only one to completion. Every other time the game has stalled waiting on connection. The one game that completed was against a player with Gaelic letters in his or her name. The four that all stalled (one after an epic thirty minute game) have been against Japanese or Chinese letter names. I don't think this is working too well across regions and it is incredibly frustrating to play multiplayer right now. I was going to drop some money on this because it seems quite polished otherwise (single player works fine, though it is dreadfully short). I think I'll hold off now though. How many legendaries have you guys gotten from the free packs?? Lovely game (3 legendaries from free packs btw including one that looks awesome called Satan). However today I just get error code 103 can't connect. Game is unplayable. Anyone else have this issue? I get the message, that there is a maintenance in progress. No eta though. Just finished the tutorial and opened my first packs with overall 3 legendaries, that's nice! I have to say though that I find the textures and everything to look a bit blurry and washed out. 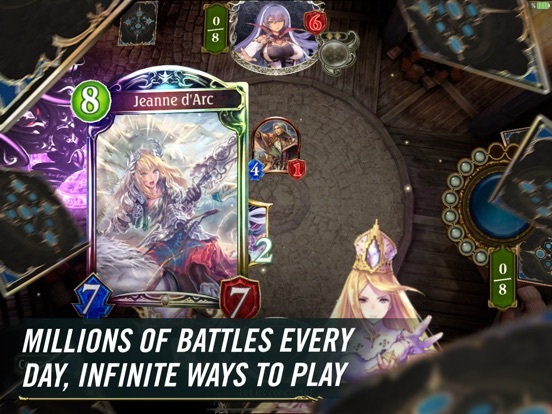 Definitely not as high fidelity as hearthstone. 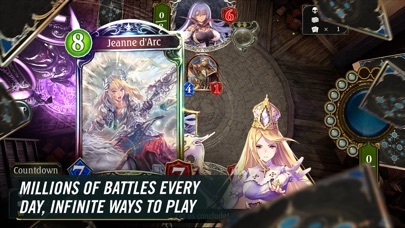 Gameplay seems very similar so far, but some classes and cards have interesting effects. Wasn't able to play much more yet, but will do so. Definitely wished this game looked crisper though. Are tickets used for anything other than cards? Lol if they are the rainbow cards then were 3/3 for getting 3. They can't possibly be the golden ones..
Hey guys! Heads up! 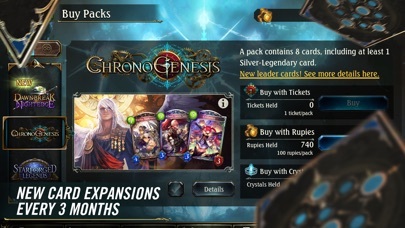 You can reroll your first packs by deleting the app and redo loading, before linking your account. This keeps your name as well (it's Availabe again). It is recommended to do that until you get about 3 legendaries and it takes ~5 minutes as you can skip most of the tutorial. Hard not to check it out with this comment. Well played. Downloading. If reviewed, crossing my fingers for Tasos. I just wish there was a way to auto bypass all of the silly story dialogs/animations. Started playing a little ranked. At low ranks it's pretty much one-step-at-a-time. 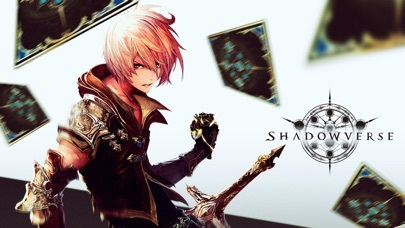 They have a subreddit with beginner tips and budget decks at r/shadowverse if you're interested. Data usage is low (~0.5MB per online match) and battery usgae is MUCH lower than Hearthstone. 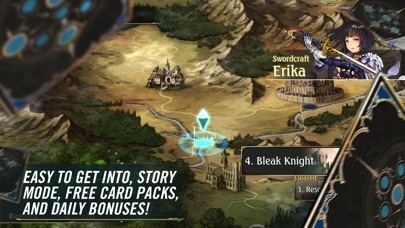 Finished 3 of the class bases story modes - cant wait for new chapters to be added.Love the art, wished they made everything animated and not create separated versions. Must try! Just downloaded and got four legendaries from my packs. Nice. This game is awesome. Slick animations and runs extremely smooth on my device. Artwork looks great, although I may or may not be a bit biased towards this game, since I'm a sucker for anything anime. Free to play seems fair so far. 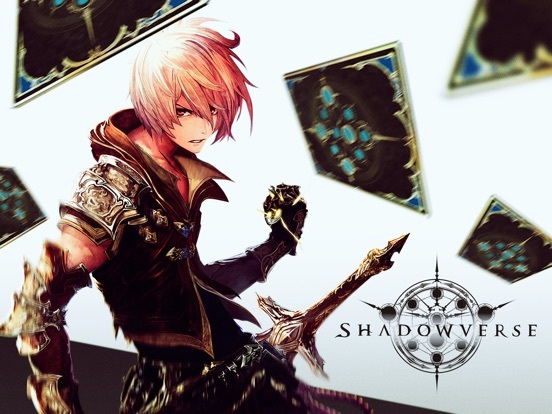 I'm thinking of making a swordcraft deck and using it as my main deck, since I got a decent amount of swordcraft cards. Has anybody here played a swordcraft deck? If so, is it good in ranked play? 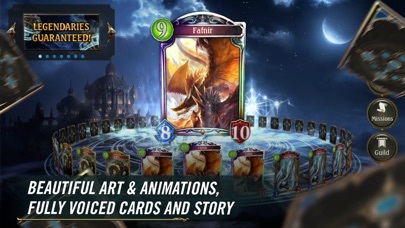 I guess it's also one way to get to see Rage of Bahamut card art too. .